Twitter has had a very rough week. The company has been the target of intense backlash since it announced its trend-bucking decision to permit notorious right-wing conspiracist Alex Jones to remain on its platform. 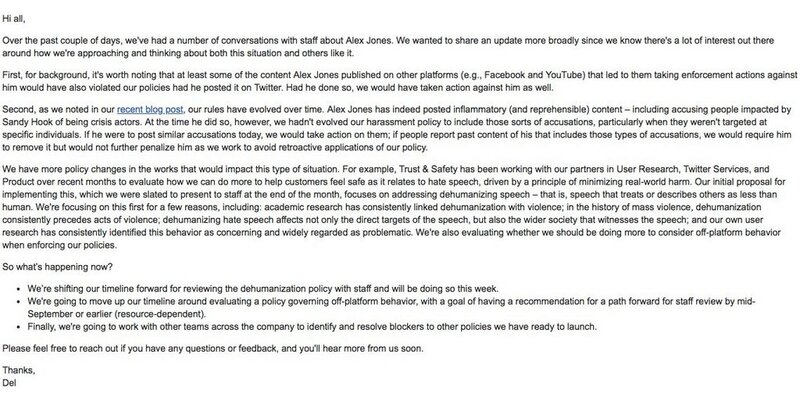 The move represented a distressing new low for a company that has been frustratingly inconsistent in its efforts to ban hate groups from using the website, shield prominent Twitter celebrities from harassment, and clarify its policies for confused users, all while protecting free speech and creating exceptions to its own rules so as not have to ban the US president from its platform. Jack (twitter CEO) reminds me of the UCLA administration when I was going there. "We have taken your matter under consideration" = We'll name a committee and ignore its report. "We are seeking input on your matter" = We'll let students comment to the committee but no one will listen, then we'll ignore the report. "We have taken your matter under active consideration" = We called the cops.